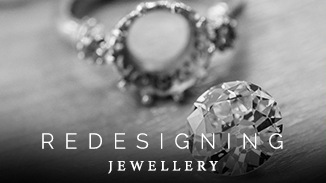 Hannah Kimber Jewellery is a bespoke jewellers based in Cheltenham, helping make your dreams a reality. 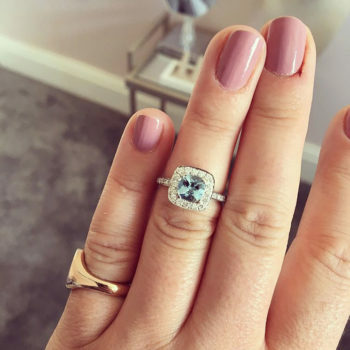 I’ve always been one for doing things a little differently, so rather than buying the ring we happened to see when out shopping I thought I’d snap a sneaky picture and get Hannah on the case to make one for me. Somewhat daunted, Hannah made the whole process very easy. 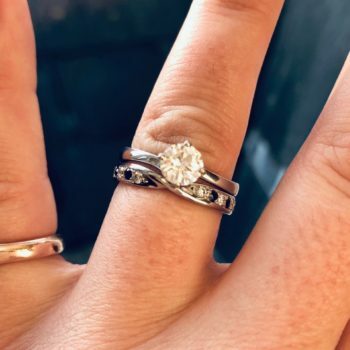 She helped me pick the diamond and the design, and despite countless emails from me changing tiny parts of the design, she was accommodating and super friendly throughout. 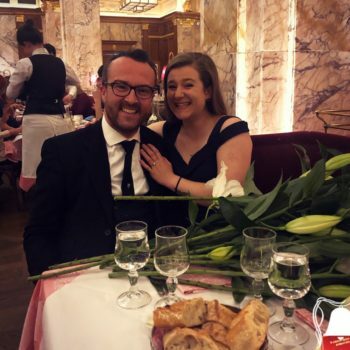 The ring was absolutely perfect and my fiancée adores it, well-done me….and Hannah. I’d spent the last 6 years looking at glittery memories of my mum in their boxes, and then putting the boxes away again ‘until next time’. Beautiful pieces of jewellery but simply not items I could wear. Then I was introduced to Hannah. We looked at each piece together – at the sentimental value and memories behind them. I talked, Hannah listened. And then she designed. And WOW! 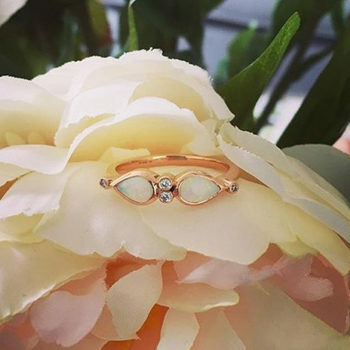 Hannah remodelled my mum’s jewellery to make several new pieces – not just for me but for my daughter and niece too. I now have a stunning and unique ring, a reminder of my mum sparkling back at me every day. And I have new treasures, made from memories, that I can pass on. Thank you, Hannah – what an emotional journey you took me on. But worth every minute! 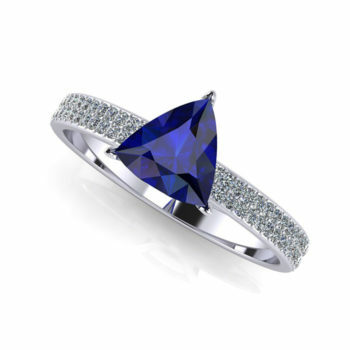 had very specific ideas about my wedding ring that Hannah helped me bring to life. I had a classic engagement ring, so I wanted something a little different for my wedding ring. 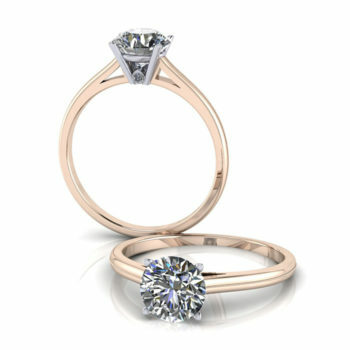 We saw sets of diamonds in different sizes plus a model before deciding which made the process so easy. I love my wedding ring, it is absolutely perfect. Thank you Hannah! 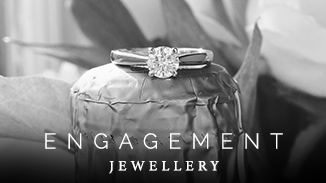 My engagement ring is the most beautiful ring I have ever seen – every day I look at it and think how lucky I am. Knowing that Will didn’t just go into a shop and pick it from a shelf makes it extra special. I love having something a bit different; everywhere I go, people comment on how lovely it is. Thanks so much to Hannah for helping Will give me the most perfect ring. He has nothing but great things to say about the whole experience. 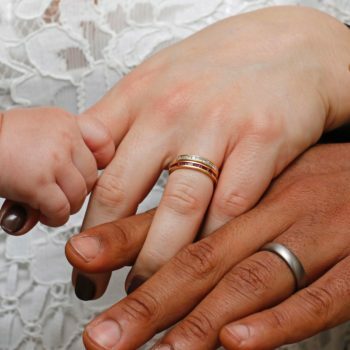 I had very specific ideas about my wedding ring that Hannah helped me bring to life. 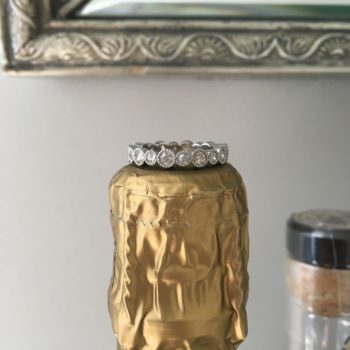 I had a classic engagement ring, so I wanted something a little different for my wedding ring. 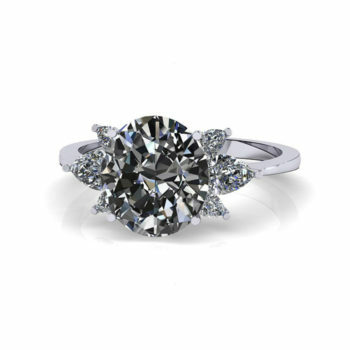 We saw sets of diamonds in different sizes plus a model before deciding which made the process so easy. I love my wedding ring, it is absolutely perfect. Thank you Hannah! We had a special family day out at Cheltenham Races planned for our Mum, where Dad’s ashes are scattered on the finish line. I had a suit and shirt especially made and Hannah designed and made me the most sensational lapel pin which everyone commented on. A fitting tribute to our Dad. 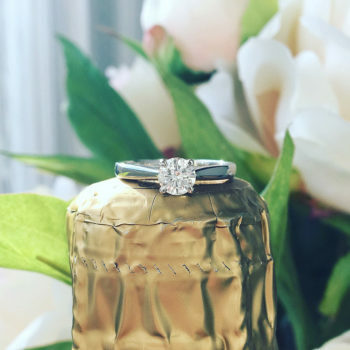 Everything about the ring that Chris designed for me is perfect! 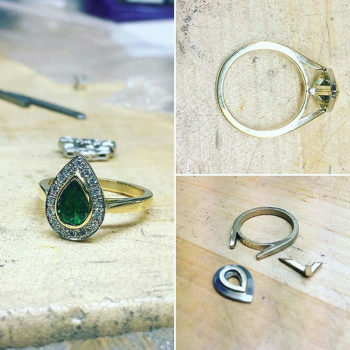 I love emeralds and yellow gold and I wanted a little additional sparkle, too. 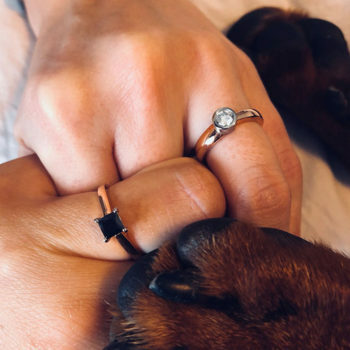 Hannah helped him to create something so thoughtful for me – and it also helps that she is my best friend so being her first official customer makes it even more special! 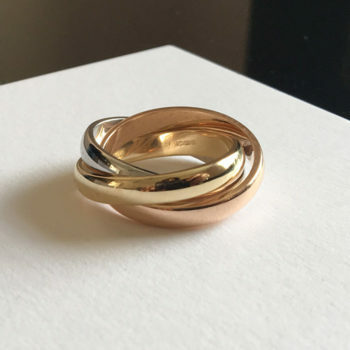 Having always loved Russian wedding rings Hannah came up with the perfect combination of yellow, white and rose gold in just the right size for my hand. The ring hasn’t left my finger since and many people comment on how beautiful it looks! 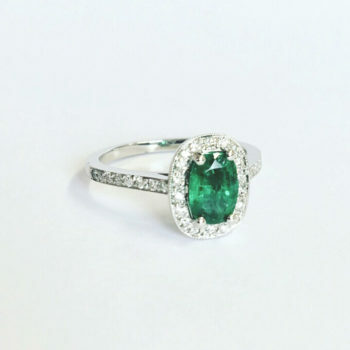 Hannah, I just wanted to say a massive thank you for my beautiful ring, I love it! I cannot recommend Hannah enough! I found her amazing work via Instagram and loved her style and designs in general. 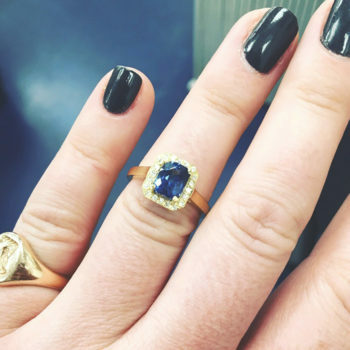 I wanted something quite specific for my fiancee’s engagement ring, so I got in touch with Hannah and the process was dreamy from start to finish. The communication was fantastic, and Hannah was just as enthusiastic about my idea as I was – in fact she was straight on the case with everything. I also had a tight timeline that I wanted to stick to which was met with no problems at all. 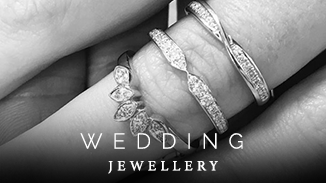 We had honest discussions about budgets and Hannah showed me a range of different diamonds within my price range – I honestly couldn’t wish for a better service. Thank you for helping Matt and I to get my engagement ring sorted. It is absolutely beautiful and it has been sparkling so brightly all over Christmas, catching everyone’s eye. I love it! You are a star! I had a pair of opal and diamond earrings which my husband had given me years before. To be honest they had seen better days, so Hannah used them to create the most wonderful ring for me, which I now wear all the time. She said yes!!! 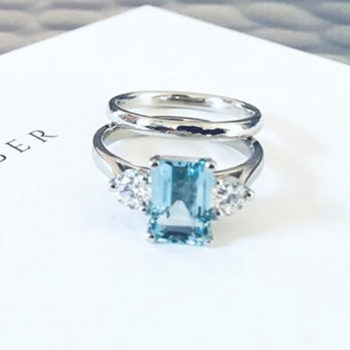 Thank you so much for all of your help designing and bringing to life the perfect ring. You took my vision and made it into something better than I could have ever hoped for. Hannah is fantastic! Her attention to detail is superb and the fact that she gets to know you and puts you at ease helps so much with any designs she puts forward. She came to my home and we spent a good hour or more chatting and discussing designs. She then came back with around five different designs, all of which were beautiful. The end result has been overwhelming! I now have a beautiful piece of jewellery that many people have commented on and I have only been wearing it for couple of days. I will most definitely be back as her workmanship and professionalism shines through. I cannot thank her enough. After 27 years of marriage my wife was devastated when she lost her engagement ring. Hannah did an incredible job of recreating it simply from my description and from photographs. Imagine my wife’s face when I gave it to her as a surprise on Christmas Day! 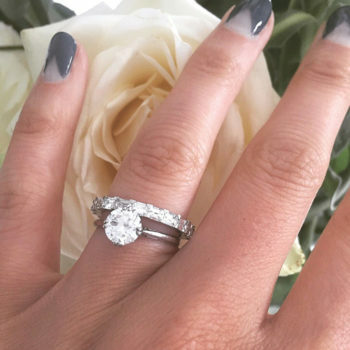 I can’t begin to describe how much I love my engagement ring from Hannah! 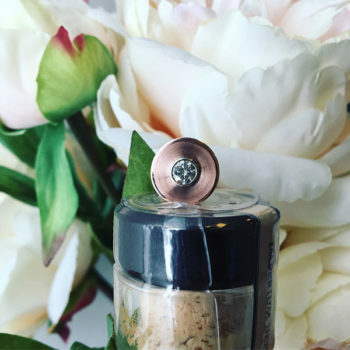 It is truly a one-off piece, and it’s so wonderful to have something so personal that has been made with so much attention and care. We didn’t know that bespoke could be so affordable but Hannah made everything work for us in terms of design, budget and timings. I am getting so many lovely compliments – we are so grateful and we really cannot recommend her enough. Hannah , I’m so in love with my wedding ring, it’s so beautiful! It fits perfectly with my engagement ring and I just want to wear it now! Thank you for making the process so easy and so personal!